Each spring, BC’s fire crews brace themselves for the intensity of the fire season ahead. At the time of writing, 2014 was on track to become a record year. Since the beginning of the season in April, more than 330,000 hectares had burned, only ~8,000 HA shy of the 30 year record. News coverage of evacuations and threats to human infrastructure have shaped our perception of forest fires. We think of them as catastrophic forces of destruction: unpredictable disasters to be suppressed or extinguished at all costs. There is, however, another side to forest fires, one that would suggest this year’s increased fire activity – if kept away from human settlement and infrastructure – is actually beneficial. Ecologists have confirmed empirically what First Nations have known and practiced for centuries: fire is as much a force for renewal as it is of destruction. After a forest fire, what appears as scorched wasteland is actually an ecosystem ready to begin anew. Under the charred earth, roots and seeds lie waiting to capitalize on the nutrients provided by the ashes of their predecessors. Sunlight, once scarce under the thick canopy of mature trees, now reaches the ground, allowing grasses and berry-producing shrubs to flourish. Burned trees still standing provide habitat for many species of insects and birds. Fire is nature’s own highly effective method of ecological restoration. We live in a province shaped by fire; the plants and associated animals found in a particular location are a product of that area’s fire regime. Before the introduction of modern fire-suppression techniques, scientists estimate that around 500,000 hectares of forest burned in BC each year, a figure that dwarfs the sum of even the most prolific fire seasons of recent years. Just as fire shaped BC’s landscape, an absence of fire is shifting it again. In the many areas where the natural fire cycle has been interrupted, trees have invaded grasslands, forcing wildlife to look elsewhere for forage. Fuel, in the form of dead wood and debris, has built up on forest floors, creating the potential for more intense, more dangerous fire events than would have occurred under the natural fire regime. Perhaps one of the most graphic unintended consequences of fire suppression is the Mountain Pine Beetle epidemic. Historically, areas of pine forests would have burned down and regenerated roughly once every 100 years, resulting in multi-aged forests that were more resistant to insects and disease. Modern fire suppression has led to vast, interconnected stands of old pines- a favourite food of the beetle. Add to this increased temperatures that allow the beetle to survive through the winter, and you have the worst insect epidemic in BC’s history. Jordy McAuley has witnessed first-hand the effects of fire suppression on lands where burning was once an integral part of the forest lifecycle. 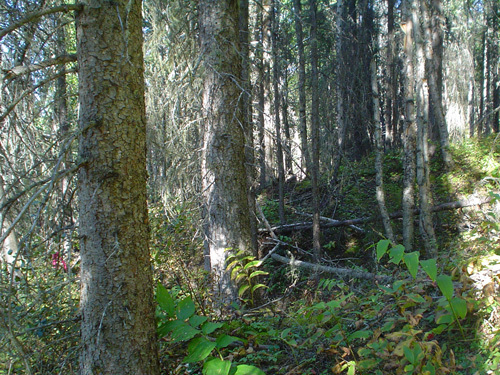 His outfitting territory in the Williston area of BC includes large stands of mature aspen and pine-beetle affected forest. 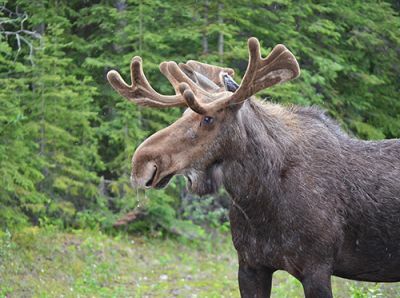 The encroachment of trees on previously open areas, combined with flooding caused by the creation of the Williston reservoir, has severely reduced the amount of winter range available for ungulates such as moose. They have begun to travel beyond their traditional range to higher elevations. With them come the wolves, and that’s bad news for the caribou who overwinter there. “The caribou are easy targets… they’re really struggling,” says McAuley. “If we can improve range conditions for moose and other ungulates at elevations lower than where the caribou are, it would hopefully lure the predators away and give them a chance.” Since purchasing the territory nine years ago, McAuley has been keen to bring fire back to the landscape after witnessing the improvements to range conditions following prescribed burns in other regions. “Once you burn, everything comes back new,” McAuley says. “The canopy opens up, and there’s this rejuvenation of forage for all kinds of wildlife. Moose do well, same with elk and goats. The berries come back, providing food for bears – even birds seem to benefit.” McAuley’s observations are consistent with research showing increased species use of habitats after burning. Properly executed, prescribed burns create a mosaic of habitat types that can support an increased number of species, and provide the resources necessary to sustain their populations. Indeed, the broad scale restorative properties of prescribed burning make it an attractive land management tool, but conducting burns is expensive, and some of the Province’s burn programs are reliant on external funding. 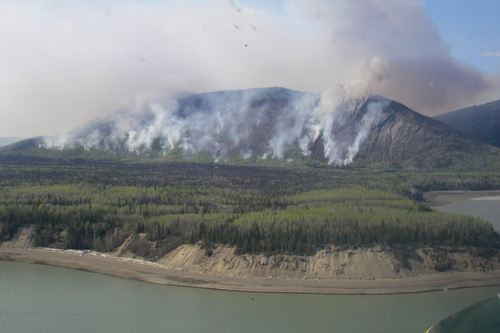 Using hunting licence surcharge revenue, the Habitat Conservation Trust Foundation (HCTF) has supported prescribed fire projects, such as the Peace-Liard Burns, for thirty years. In 2014-15, the Foundation invested over $350K in prescribed burning programs across BC, including McAuley’s moose habitat enhancement project. With funding for his project secured, McAuley began working with a team of biologists on the burn planning and consultation process. In an era of multiple (and often competing) uses on the landscape, accommodating the perspectives of all stakeholders can be a difficult task. It’s a delicate balancing act between protecting everyone’s interests and still accomplishing an effective burn. Biologist and Wildlife Infometrics’ staff member Stephanie Rooke agrees that the burn approval process can be daunting. “There are many, many factors to consider, and some real constraints on what we’re able to do,” says Rooke. “Often, the lands we’re working on are next to forestry plantations, and there are First Nations communities nearby… safety is always our number one concern. We can’t afford to lose a fire.” Rooke says there are a number of precautions that are used to make sure that burns stay in control and away from human settlements. “The Wildfire Management Branch has indices that we use to determine when it is safe to burn: factors such as temperature, moisture, and relative humidity all have to line up before we’ll start a fire. But our biggest control mechanism for spring burns is high-elevation snow load: because we’re burning uphill, we try to have the edge of where we want burned bordered by snowpack.” Despite challenges in the planning process and narrow windows for burns, the project team persevered and managed to get their first burn done this May. McAuley was on site for the big event, excited to finally see his idea become reality. “It was such a big build up: in the beginning, it was like running into walls. I’d tell people what I wanted to do, but with all the merchantable timber up here, they’d say it can’t be done. But I just kept pecking away, and found some folks that knew the benefits of fire on the land,” recounts McAuley. “To see that helicopter show up, ready to go… well, it was pretty exciting to see that smoke start coming out of the bush” Over the next few years, the project team will monitor this and other planned burn sites to determine what effect fire has had on forage availability and use by ungulates. “Our hope is that the herbaceous plants and shrubs that recolonize burned areas really make a difference for moose populations in the area,” says Rooke. “Shrubs are particularly important in winter, when the deep snow makes it difficult for moose to access other forage.” If the project proves a success, the team is hopeful they can share their experiences with others interested in using fire to enhance range conditions. “There was a steep learning curve for everyone, but now that we’ve done it, I think there’s the potential for others to follow in our footsteps, and maybe initiate their own projects,” encourages McAuley. “I think getting fire back on the land, when done properly, has the potential to benefit everyone.” In addition to HCTF funding, this project also received financial support from the Peace/Williston Fish and Wildlife Compensation Program. For more information on projects made possible by angling, hunting, guiding and trapping licence surcharges, click here.